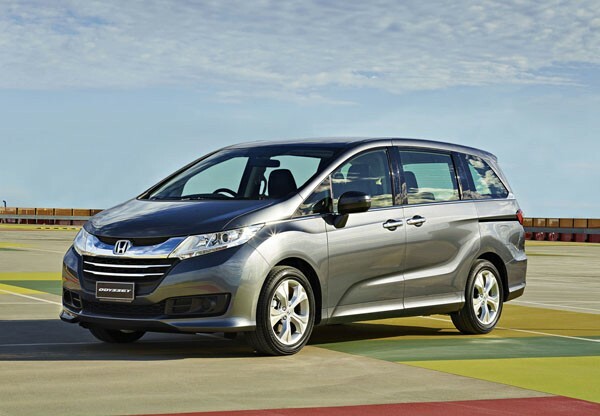 Honda has made a major change of direction in its fifth generation Odyssey people mover. Previously it has followed passenger-car, station-wagon lines, making it easy to drive and park and – dare I say it? – more popular with female drivers. Odyssey now has an extra 150 mm in height to give it a more spacious interior. 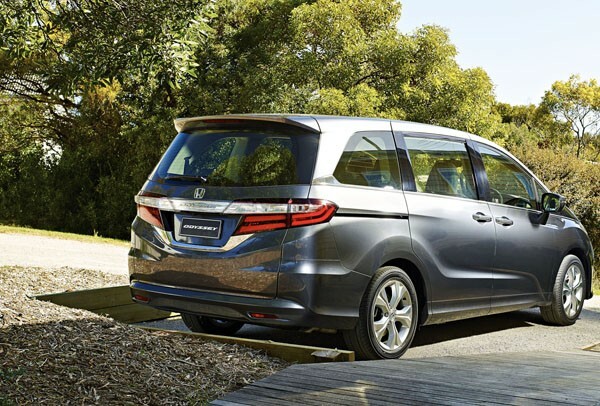 Odyssey competes with the likes of Kia Carnival and Toyota Tarago in the people mover field. It almost impinges on the van-based VW Transporter, Mercedes Vito and Hyundai iMax. The Australian importer makes no bones about wanting to chase the commercial operators, not just private buyers. Odyssey features much bolder lines than just about anything else on the market, which is a big surprise after many years of rather conservative bodies. The huge chromed grille attracted a lot of attention from all who saw it as it really does dominate the front of the vehicle. There are prominent front guards and upswept sculpted lines on the side of the vehicle have a touch of Italian to them. 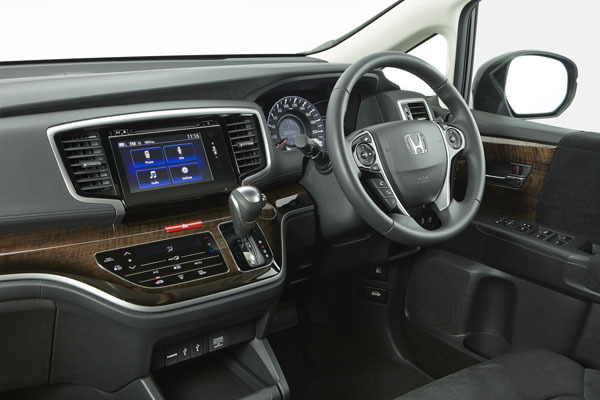 The Odyssey’s information and entertainment system uses a dashboard-mounted colour touch screen to display audio functions, Bluetooth features and the car system’s information. We found the touch screen to be quite frustrating to use at times during our initial drive during the launch in February this year. Further use for a week in our home area saw us becoming more accustomed to it, though we feel it should have been better. In a cost-saving move that’s likely to become increasingly common the new Honda Odyssey doesn’t come with satellite navigation either as standard or an option. Instead it relies on the assumption that most drivers will have a smartphone that provides access to a special downloadable app which links through Bluetooth to the car’s in-dash monitor. There is only one powertrain; a 2.4-litre four-cylinder petrol unit with peak power of 129 kW and top torque of 225 Nm. The biggest change in the drivetrain is the replacement of the five-speed automatic with the greater efficiency of continuously variable transmission (CVT). All models of the Honda Odyssey come with front and side airbags as well as curtain airbags that cover both second and third row seats. Crash prevention items include ABS brakes with Brake Assist; Emergency Stop Signal; Vehicle Stability Assist and Traction Control System; Tyre Deflation Warning; and Daytime Running Lights. The upmarket Odyssey VTi-L adds Blind Spot and Cross-Traffic Warning; Smart Parking Assist; and a multi-view camera system that uses four fisheye cameras located in the grille, door mirrors and tailgate to provide a choice of 180-degree wide and overhead views. All seats are large and comfortable. The seating in the eight-seat Odyssey VTi is two-three-three; the seven-seat VTi-L (as tested) is two-two-three. Good legroom is provided for all six of the outer seats. This will be huge bonus to those with children in their teenage years. It also explains why Honda Australia is keen to attract buyers from the likes of hotels, perhaps even hire-car operators. The second row individual bucket seats in the VTi-L come with a built-in adjustable footrest. The seatbacks can also be reclined and, when the third row seats are folded flat, the central seats can slide up to 740 mm forwards or backwards as well as laterally. So there’s a huge range of choice. New Odyssey has sliding rear doors instead of the conventionally hinged units on all previous generations. Both doors on the higher-specced Odyssey VTi-L, but only the left-rear of the entry level Odyssey ViT, can be operated remotely either through the key fob or by a pull of the handle. Boot space has been increased over the outgoing model by storing the spare wheel under the front seats. However, it’s only a small area and struggles to hold more than one large suitcase and a couple of smaller bags. While you do get more luggage depth the passengers in the centre row of seats aren’t able to put their feet under the front seats due to the bulge created by the spare wheel compartment. Honda Odyssey cruised effortlessly and quietly as the engine has strong torque over a wide rev range. We appreciate the efficiency of CVT automatic and can’t understand why some people don’t like the engine operating at its best revs. These people can use the steering wheel mounted paddles to manually override the system. Keep in mind you’re losing performance, and probably increasing fuel consumption by doing so. Fuel consumption during our test period was in the seven to eight litre range during motorway driving, climbing to eight to ten litres per hundred kilometres in suburban work. Impressive figures for a big seven-seater. The suspension generally copes well, but rough roads can cause it hassles at times. Handling really isn’t the reason you choose a people mover, particularly a Japanese one, but the big Odyssey is safe and sure at higher than normal cornering speeds. Thus leaving a good margin of safety should you accidentally enter a bend too fast. All-new Honda Odyssey provides a lot of interior space in a quality vehicle with standout lines. Note: These prices do not include government or dealer delivery charges. Contact your local Honda dealer for driveaway prices.